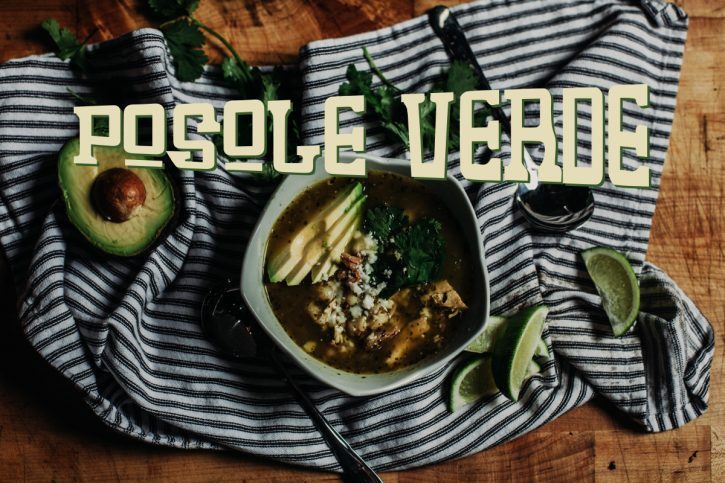 Posole (or Pozole) is a traditional Mexican soup that can features pork or chicken, and prepared with a green or red salsa. We can’t get enough of salsa verde around here, and what better compliment to salsa verde than smoked chicken?! We start with the salsa. Putting a little char on the ingredients will add a smoky depth to the flavor profile. Good ol’ spatchcock chicken! It’s, hands down, our favorite way to cook whole birds. Preheat your Yoder Smokers YS640 pellet grill to 500ºF, set up for direct grilling. Place the tomatillos, jalapeños, Anaheims and onion quarters on the grill. Blacken all sides of the peppers, then transfer to a plastic zip top bag. Grill the tomatillos on all sides until the are softened and you have nice grill marks. Grill the onions on all sides to get some char and slightly soften. After removing all veggies from the grill, turn the grill down to 250ºF, and put the diffuser plate back in, set up for indirect grilling/smoking. Spatchcock the whole chicken, remove the backbone with poultry sheers, and pressing the bird flat. Loosen the skin from meat, but do not remove. Mix the Cattleman’s Grill 8 Second Ride Carne Asada Seasoning, Cattleman’s Grill Steakhouse Seasoning and ground cumin. Season the flesh of the bird, under the skin, with the rub. Lay flat, skin side up, on a foil lined baking sheet. Place in the smoker and cook until the internal temperature in the breasts reaches 160ºF. Remove from the grill and rest. While the chicken smokes, remove the peppers from the bag. Peel the skin off. Remove and discard the seeds. Trim the root end of the onions and discard. Place the peppers, onions, tomatillos and garlic in a food processor, or blender, and puree until smooth. Pull the meat of the chicken from the bones and shred by hand. Place the chicken in a Lodge Logic 7 quart dutch oven. Add the rinsed hominy, tomatillo salsa and two quarts of chicken stock. Simmer for 20 minutes to marry the flavors. Serve with your choice of garnishes.